Well, friends, it's the end of an era. How I Met Your Mother ends tonight and I've already bought a case of wine and 3 boxes of Kleenex. I feel like this is our generation's equivalent of FRIENDS going off the air. I can remember my mom and all of her friends having a finale party and I couldn't for the life of me figure out why they were so attached to a TV show. Well, here I am, mourning the end of HIMYM. I'm that girl. So, to pay tribute to one of the greatest shows of our time, I've come up with 11 things How I Met Your Mother has taught us. 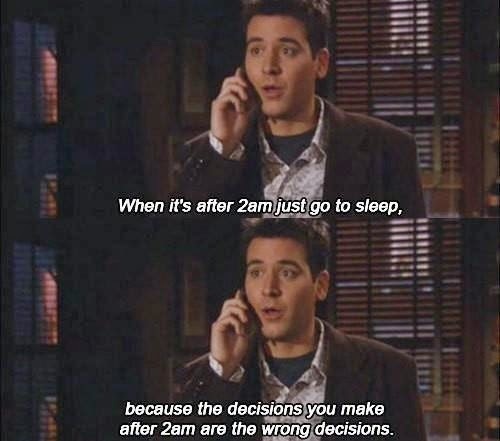 (one) Nothing good ever happens after 2 am. But really, we all know it's true. Just go home. (two) The "Naked Man" is proven to work two out of three times, but really guys, it's not necessary. Unless you're Adam Levine, just keep your clothes on. There are other ways to woo a girl. 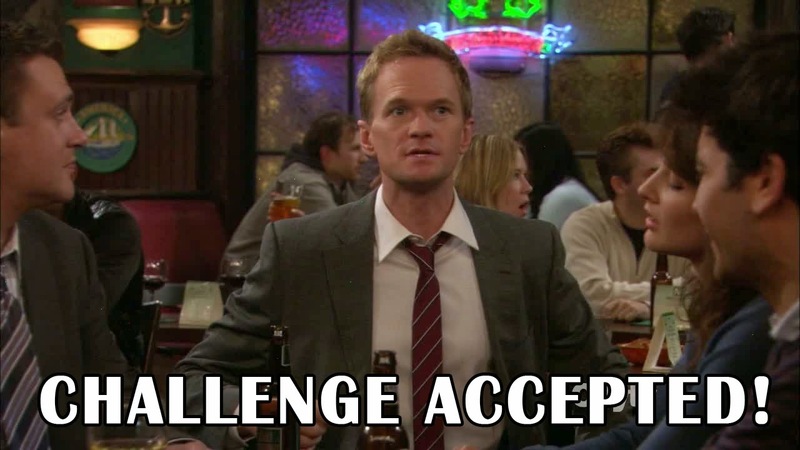 (three) If someone challenges you, your answer should always be "challenge accepted." Not necessarily to win a girl, but to take a chance. Do something that isn't in your comfort zone. Live a little. After all, what if you miss out on the greatest adventure of your life? (four) Interventions are a necessary part of friendships. When you become concerned over a friend's silly obsession with a particular fad, by all means, get yourself a banner, gather up the gang, and hold an intervention. Sometimes only our friends can save us from ourselves! (five) Ladies, on the Hot/Crazy Scale, always stay above the Mendoza Diagonal. And if you don't know what that is, you better look that up and watch yourself! (six) If HIMYM taught us anything, it's patience. As Barney says, "wait for it." While he only uses it to create suspense, Ted keeps on telling us that waiting for it--as in, waiting for the one--really is worth it in the end. Enjoy life as it comes, and just wait for it. (seven) You'll never look at a yellow umbrella the same way again. (eight) One of my favorites--live by Barney's mantra..."When I'm sad, I stop being sad and be awesome instead." Barney may be an egotistical womanizer, but you gotta love that man. (nine) 10 minutes is all you need for a good first date. Ah, Ted...the romantic at heart. (ten) If you can't spot the "woo girl" in your group, it's probably you. And that's okay, refer to number 5, and you'll be alright. (eleven) And probably the most important, every friend in your life needs to pass the "porch test." Look at yourself sitting on your front porch with those friends in 50 years. Will you still want them around? If not, they're not worth your time now. You'll find the ones you will want around for the rest of your life. Swarley, the pineapple, slutty pumpkin, slap bets, Robin Sparkles, Maclaren's, just to name a few...we'll miss you. And yes, I get too attached to TV shows, I'll be the first to admit it. So, if you need me, I'll be binging on HIMYM episodes on Netflix until the finale tonight. 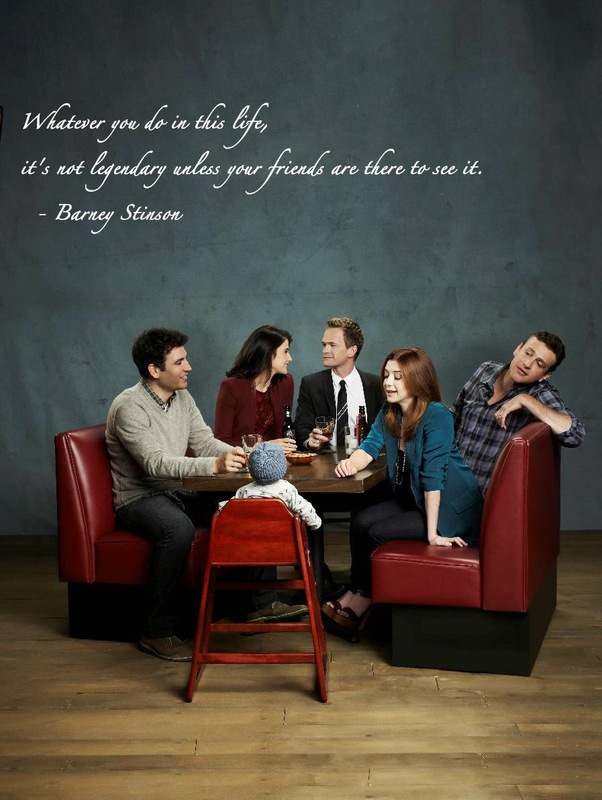 Thanks for the memories, HIMYM. It's been legen-wait for it-dary. Legendary. I've never been a regular HIMYM viewer, but your list is hinting that I should try it out. Thanks for sharing! I have been a fan since the beginning although I'll admit since I cancelled cable last year I've been kind of terrible at keeping up with the latest episodes. I'm planning a binge watching weekend in the near future to catch up. You're list really highlighted the best parts, except you forgot the Robin Sparkles videos!